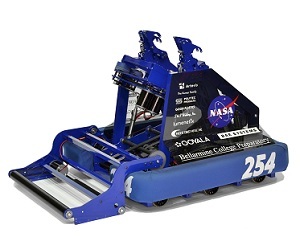 Ultimate Ascent is the 2013 FIRST Robotics Competition game. Teams of three robots each collect Frisbees and shoot them into goals of varying heights. There is also a pyramid which can be climbed at the end of the match for bonus points. More Information can be found on Wikipedia . For detailed competition history, click on the event name. Quick and highly maneuverable 6 wheel drive. Driven by 6 motors in two-speed gearboxes with max speed of 20 ft/sec in high gear and 8 ft/sec in low gear. Dual angle adjustable range shooter shoots discs from many positions on near side of the field. Fast, high-powered conveyor and lifter mechanism ensures reliable feeding of discs into shooter. Fast and reliable 10 point hanging mechanism can lift the robot to hang from the bar after the match end buzzer. 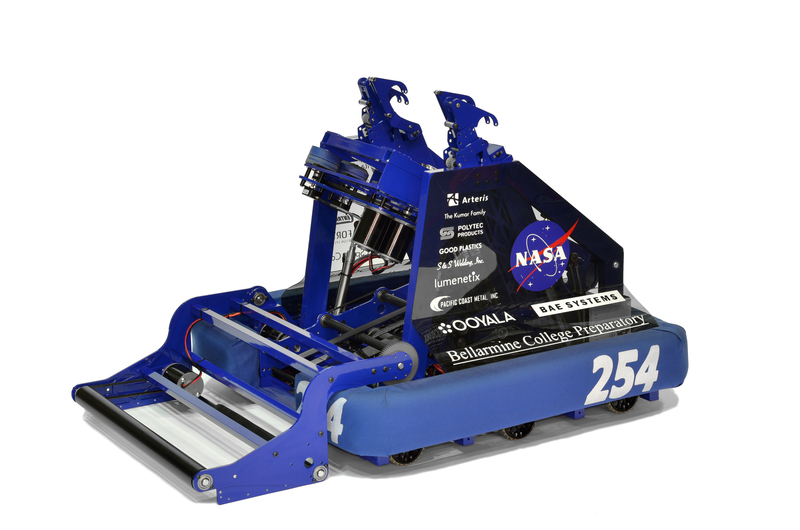 Quick 30 point hang mechanism lifts robot to top of pyramid with 2000+ watts of power from a drive gearbox power take-off (PTO). 3, 5 and 7 disc autonomous routines allow for versatile alliance strategy. Sensors include encoders, gyro, pressure transducer and hall effect sensors.